The Chester and Holyhead Railway Company, & the London and North Western Railway Company - their Rail & Shipping History in Holyhead, Anglesey. With the coming of the age of the train, the Chester and Holyhead Railway Company was formed amidst high hopes that they would not only bring the railways to Holyhead, but also win the Irish Mail contract to carry the mail from London to Holyhead, and then on to Ireland. 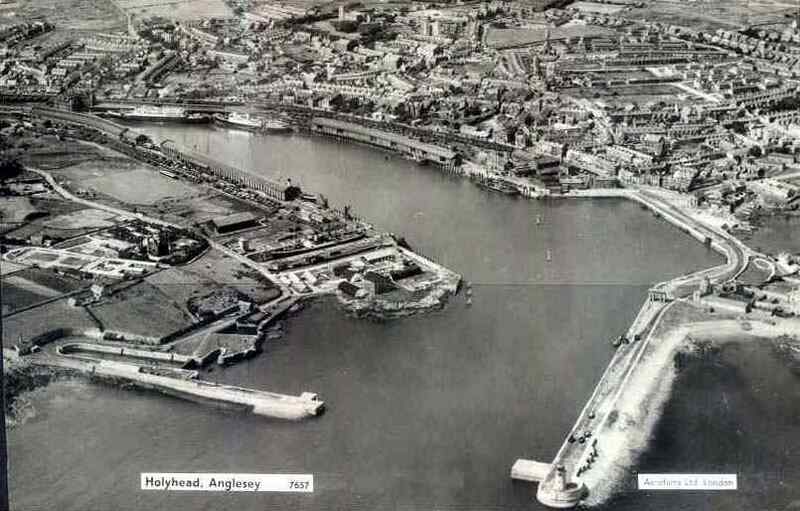 They were assured of the contract to bring the mail to Holyhead by rail, but to warrant the large investment made they hoped to win the sea voyage contract as well. In 1848 the railway line to Holyhead was completed and opened, and 4 new ships were acquired in order that they could vie for the sea voyage portion of the Irish Mail contract. They ordered four new ships. The Anglia, Cambria, Hibernia, and the Scotia. They were iron paddle steamers powered by single expansion engines, each capable of 14 knot speeds. In 1849 the sea voyage portion of the Irish Mail contract from Holyhead to Kingstown (later renamed Dun Laoghaire) was put out to tender. The contract was awarded to the City of Dublin Steam Packet Company (CofDSPCo), and the Chester & Holyhead Railway Company were bitterly disappointed. The rivalry between the Dublin and Holyhead companies involving the Irish Mail contract would go on for over 7 decades. Therefore, at this point the only contract that the Chester & Holyhead Railway Co had, involved bringing the mail to the port of Holyhead for the onward sea voyage on CofDSPCo ships. Thus, the ships of the Chester & Holyhead carried passengers, cargo, and livestock to the Irish port of Kingstown, and also cargo and cattle to North Wall port in Dublin. In 1853 as the result of an agreement made with a Select Committee of the Commons, it was agreed that four new mail ships would be purchased by the CofDSPCo, each capable of crossing the Irish Sea in three and three quarter hours. As the ships of the CofDSPCo also carried paying passengers this gave them a distinct advantage over the Chester & Holyhead ships, which took five hours to make a crossing. The Chester & Holyhead was taken over by the L&NWR Co in 1859. By October 1861, the L&NWR gave up its Kingstown passenger terminal, concentrating its service on sailings to North Wall Dublin. This was because the trade in livestock had increased, and during the 1860's they built faster ships, retiring the older ones one by one. The Irish North Western Railway extended its rail line from the port of Dundalk to a new port at Greenore, run by the L&NWR. The operation started in1873. In 1876 a further line was opened to the port of Newry. The new ships were again iron paddle steamers, and were named; Duke of Sutherland (1868), Countess of Erne (1868), Duchess of Sunderland (1869), and Edith (1870). More expansion was to follow a few years later, when larger and faster ships were ordered for the Greenore service named; Rose (1876) and Shamrock (1876). 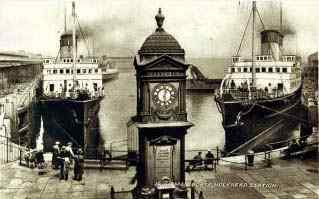 In 1880 extensive redevelopment of the harbour at Holyhead was completed, and included docking facilities that put passengers directly onto the rail platform, a wonderful hotel, and large cargo sheds .It was opened in 1880 by the Prince of Wales, and a harbour clock was erected to commemorate the event. Two more ships were ordered - Lily (1880) and Violet (1880), making up the express service fleet to four. These ships operating to North Wall Dublin carried only passengers and cargo. The cattle were now carried in dedicated ships of their own. In 1883 the L&NWR operated at least 14 ships, including 4 express passengers, and 3 on the Greenore service. Despite all of these improvements to their fleet, and even though the L&NWR won the Irish Mail contract in 1883, the contract was re-awarded to the CofDSPCo following disruption in the House of Commons led by Irish MP's. In 1883 two new cattle ships arrived, both of steel construction, and with twin screw propellers. The Holyhead - lost in a collision the same year - and the North Wall. The Irene replaced the Holyhead in 1885. More ships followed, the Banshee in 1884, another iron paddle steamer, and the Olga and the Anglesey in 1887/8 respectively. At this time it is evident that the length of service of any given ship on the service was 20 years, so ships were continually being replaced by a more modern fleet. On the 13th of December 1893 the Rose sailed from Holyhead. An hour into her journey the main crankshaft broke, and she was subsequently sold on as she was. Because of dissatisfaction with some of the ships built by Laird's, the company of Denny Brothers of Dumbarton was awarded the contract to build the next L&NWR ships. In 1906 the last of the paddle steamers - The S.S. Banshee - was sold. It was the end of an era. In 1907 a new passenger ship was ordered - Rathmore - and Rosstrevor had her first class accommodation removed, and she was put on the North Wall cargo service. 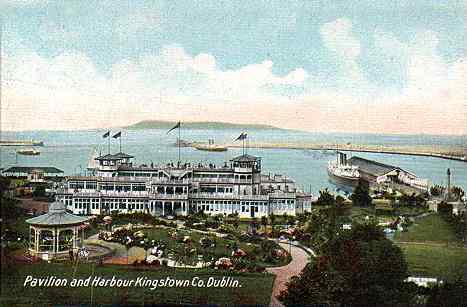 In the same year because of increased dock dues demanded by the Dublin Dock Board, the L&NWR at last decided to return its operation to Kingstown (later Dun Laoghaire) where the dues were less. In 1911 a new ship was ordered - Greenore - to replace the 40 year old Edith, and in 1914 Curraghmore replaced the Galtee More. 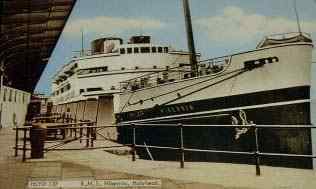 The Curraghmore was the first turbine propulsion ship on the route. Then came the first world war, and ships of the L&NWR and the CofDSPCo were commandeered by the War Office. All of the L&NWR express ships were commandeered for war service. 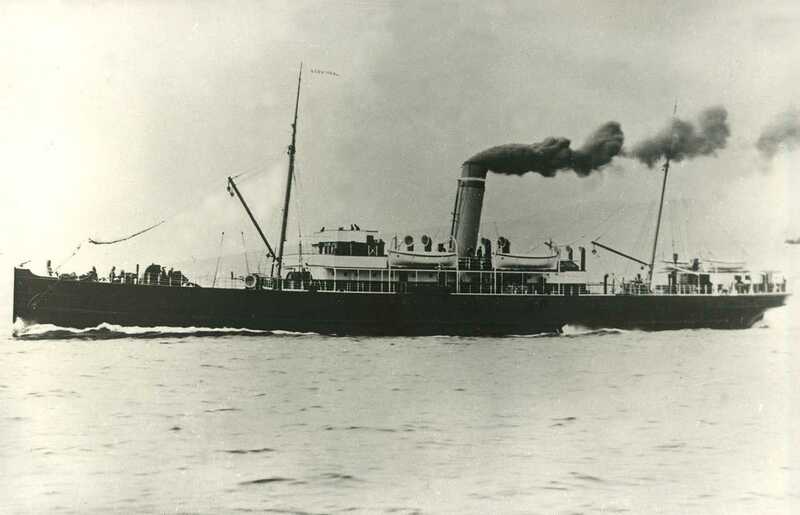 The L&NWR ships - Hibernia, renamed HMS Tara, and the Anglia - were both sunk, whilst the Connemara and the Slieve Boom were lost in a collision. Two of the CofDSPCo ships were also lost during the war, the Connaught was on active duty as a troop carrier when it was torpedoed in the English Channel. The Leinster was torpedoed in October 1918 and sunk on her normal route from Kingstown to Holyhead with the loss of 501 lives. 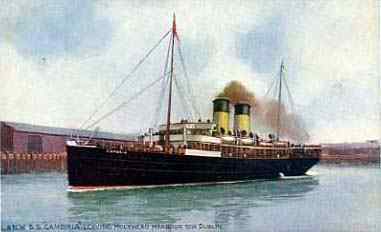 Following the war the CofDSPCo did not have the finances to recover from losing her ships, and the Irish Mail contract was awarded to the L&NWR. New ships were ordered and the new service began on the 28th November 1920. The new ships were once again named Anglia (1920), Hibernia (1920), Cambria (921), and Scotia (1921). 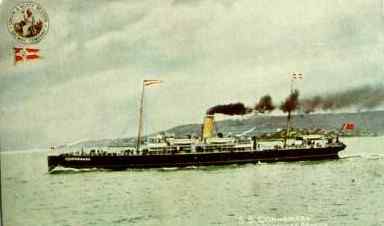 In 1921 the Slieve Donard - a cargo carrier - replaced the Slieve Bloom, and was notable as the last ship built for the L&NWR. On the 1st of January 1923 the L&NWR became part of the LM&S - London , Midland and Scottish Railways. 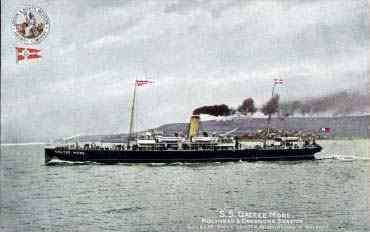 The economic climate of post war Britain coupled with the division of Ireland left trade with Ireland at an all time low, and the Greenore passenger service ceased operation, and the cargo into North Wall Dublin was reduced.